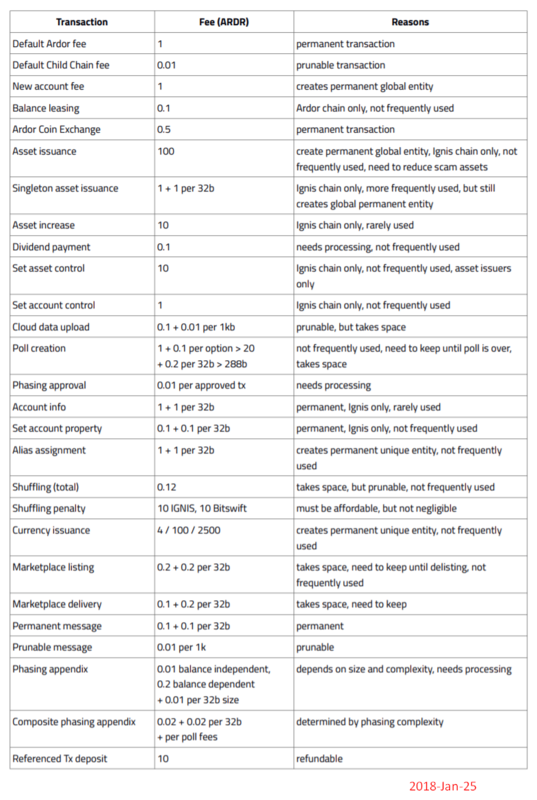 The fee structure can be found on this fees chart for Ardor provided by Jelurida, the developers of Ardor. There is no fee to mine, and no fee to bundle. But when you bundle, you are receiving child chain tokens, such as IGNIS, BITSWIFT, or AEUR, and then paying the forgers (miner-equivalent for Ardor) the respective fee in ARDR based on the chart that I linked. As a bundler, you get to set the rate that you would like, the maximum amount of fees you're willing to pay, and other settings. Running a bundler is also a great way to convert ARDR into child chain coins because unlike using the Coin Exchange feature on Ardor where you can trade child chain coins and ARDR against each other, you won't be paying fees yourself for making the trade. It's not as fast though since it depends on the transaction volume on that respective child chain. Not the answer you're looking for? Browse other questions tagged transaction-fees ardor ignis bundler child-chain or ask your own question.